International Mother Language Day, observed for nearly 20 years, is an opportunity to celebrate linguistic diversity and multilingualism. 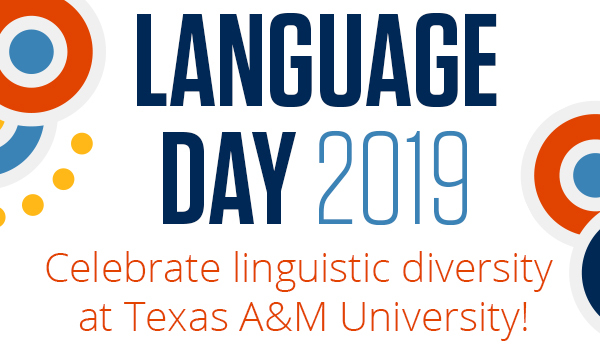 This year, the Language Matters Working Group, the Texas A&M Libraries, Department of Hispanic Studies, and the Center for Teaching Excellence are co-sponsoring three days of activities meant to promote linguistic diversity and multilingualism at the University. Join us February 26–28 for a variety of activities related to all things language and linguistics. Multiple language-themed tables and exhibits such as linguistic bilingual poetry exhibits, linguistic treasure hunts, exhibits on languages of Texas and many more engaging and educational activities. Twelve short linguistics presentations by researchers from across the campus including students and faculty. Each talk will last 5 minutes. Dr. Whitney Chappell (UT San Antonio) will will give a speech titled Social and Linguistic Perception in a Heritage Language: The Socio-indexical Knowledge of Second-generation Spanish Speakers in the United States. Languages, with their complex implications for identity, communication, social integration, education and development, are of strategic importance for people and planet. Yet, due to globalization processes, they are increasingly under threat, or disappearing altogether. When languages fade, so does the world's rich tapestry of cultural diversity. Opportunities, traditions, memory, unique modes of thinking and expression—valuable resources for ensuring a better future—are also lost.